The coat or shield is fractured in several places. 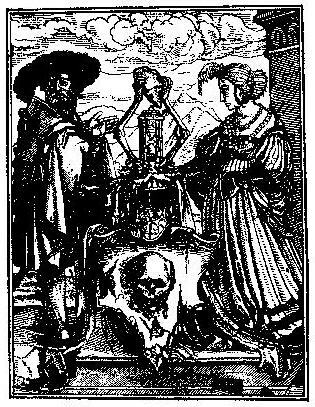 On it is a skull, and at the top the crest as a helmet surmounted by two arm-bones, the hands of which are grasping a ragged piece of stone, and between them is placed an hour-glass. The supporters are a gentleman and a lady in the dresses of the times.